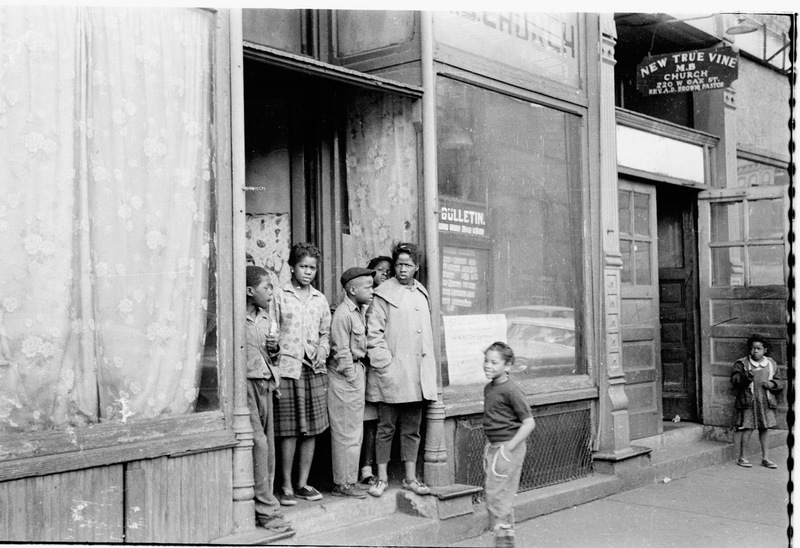 Kids at the New True Vine MB Church, Chicago, 1961. Photo by Michael James from his forthcoming book, Michael Gaylord James' Pictures from the Long Haul. I take their pictures, and I realize now that things are beginning to come together: people of different colors, poverty, photography, Chicago, and change. I am in the early stages of my own new true vine. Early September 1960 and I'm out on the highway again, heading across Pennsylvania-Ohio-Indiana and into Chicago, then the "hog butcher to the World." This time I'm in a yellow and black 1957 Desoto convertible with my folks, Hal and Florence James. Day breaks and we pull up to the Executive House on Wacker Drive. At noon we wind our way up Sheridan Road and I begin going through the final steps to be a college student; I'm a brand new freshman at the small Presbyterian-affiliated Lake Forest College just outside Chicago. Incoming Foresters are given a red and black beanie with class of 1964 stitching. I was already partial to red and black, they being the colors of my earlier teen years passion, the Downshifters Hot Rod Club. Later I'll learn red and black are anarchist colors, a political stripe I have affinity with, though I end up being closer to democratic centralism in my street fighting and community organizing days. Later I will reluctantly return to my early Democratic Party political roots; thanks Mom and Dad, and Go, Adlai Stevenson. These days I see involvement in the progressive wing of the Democratic Party as analogous to Mao working with Chiang Kai-shek to hold back the Japanese. There's a lot (!!!) to be desired about the Democratic Party, but stopping right wing Republicans and the rise of fascism is high priority. I'm not about to wear a beanie, even when Dad says he doesn't think things have changed since his days at the University of Chicago. And I'm certainly not going to wear it after a guy from the Kappa Sig fraternity tells me to put it on. I'm all about school spirit but was voted "coolest" in my Staples senior class and I'm not about to compromise on this headwear. After a goodbye to the folks it's on to meeting people and checking out the new scene. I have my first Commons aka cafeteria experience. On Monday I'm a walk-on and become a member of the Foresters football team. I'll develop good relations with the cafeteria workers. I have fond memories of running wind sprints in crisp fall weather at dusk, then words from the coaches, loving the hot shower, and loving even more extra plates of food in the Commons. The football games and their bus rides take me to new places, playing schools previously unknown to me. We're talking Augustana, Carthage, Millikan, North Central, Illinois Wesleyan, Monmouth, Elmhurst, and Hamline. I will break four bones in my right hand when hitting a tree, on an angry spree, after returning from a game in Rock Island by bus and my girlfriend Lucia hadn't signed out for an overnight (with me). In the fall of 1963 the University of Chicago is bringing back football, and we play their club team. My dad played a year there under the legendary coach Alonzo Stagg. Wasylik, Hanke, and Triptow are my coaches. This game would be my last, following a halftime challenging-authority altercation with coach Nick Wasylik, who actually was a fine guy. The world continues to open up for me. I discover sociology (or sociology discovers me); I thought that was how one became a social worker. A professor encourages me to think about the big picture and the social-economic-political forces and conditions that shape peoples' lives. I'll head off to University of California Berkeley on a Woodrow Wilson Fellowship in 1964 and on a return visit to LFC my professor-sociologist-hero Dr. Don Roos and I argue over the Vietnam War. I was so disappointed! History professor Carl Perrini, who studied with UW Madison's William Appleman Williams (a founder of Studies on the Left), shows me the Autobiography of Big Bill Haywood; I read my first book about radicals, learning about the Western Federation of Miners and the Industrial Workers of the World (IWW). From Haywood I pick up a tip. When Rockefeller's Pinkertons and the FBI were after Big Bill it was the local cops who tipped him off. I've been friendly with local cops even during wild rebellious times. One was the late Maurie Daley of Chicago's infamous Red Squad. He harassed, spied-on and chased many a radical, but was certainly a more likeable Red Squad pig than the Eastern European dudes. Maurie's kid also played football at LFC, a fact I learn while talking to Daley when I spot him sitting in a van on a drug stakeout. Earlier he had made contact after being transferred to the 24th District, leaving a message for me at the Heartland Café saying he was "Che Guevara's nephew!" I develop admiration for many teachers at LFC. Gerry Gerasimo turns me on to issues of social class, status, and conflict; George Tomashevich introduces me to Africa's depth, the Ashanti, and African independence movements. Sculptor Helmut Van Flein transfers my hot rod welding skills into making sculpture. Sam Pasiencier, mathematician turned spiritual guy, helps me develop my Mexico 1962 photos after I drive my Triumph motorcycle to Mexico. And Alan Bates tells me I need to rewrite, that my words aren't golden the first time out. He also turns me on to Lawrence Ferlinghetti and his way-cool Coney Island of the Mind. Dr. Smucker is the College Chaplin and teaches a Christian Ethics class. He initiates my interest in Christian communal sects like the Amana Colonies and New Harmony, Indiana. A Mennonite and a wonderful guy, he returns a paper I had written on Gandhi that ended with an upbeat paragraph about truth and goodness triumphing in the end. Donovan Smucker says: "not necessarily," and gives examples of unfortunate endings to human struggles. He calls me a "meliorist" and I confess that to this day I still believe conditions for people can and should improve. It's up to us to make it happen. The class takes a field trip. We visit various housing sights in Chicago. We look at Lake Meadows and its' three large "integrated" buildings; the lower income building is 70% black, while the highest-rent abode building is 70% white. The midrange-rent building is 50% white and 50% black. And we visit the Cabrini Green Projects. Now I had been in situations where I was one of a handful of whites among blacks -- on visits to the Apollo Theater in Harlem, going to see Mahalia Jackson, the Swan Silvertones, and the Dixie Hummingbirds et al at Madison Square Garden, Ray Charles at the Pan Pacific Auditorium in San Jose, and a high school graduation party in Norwalk, Connecticut. However, being a white guy with a busload of white students, I find myself wandering behind the class. That's when I run into the kids outside the New True Vine MB Church. 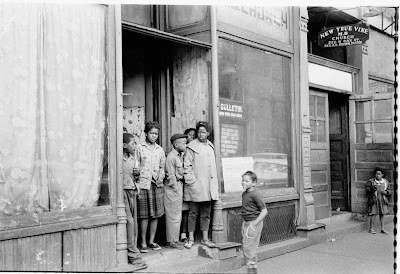 I take their pictures, and I realize now that things are beginning to come together: people of different colors, poverty, photography, Chicago, and change. I am in the early stages of my own new true vine.